Smartphone screens attract bits of dirt, dust, and other particles, leaving your screen a grimy mess on a daily basis. Although wiping down your device with the edge of your shirt — or smudging the screen with your fingers — certainly helps tidy up the display on your smartphone or tablet, there are far better methods for thoroughly cleaning your device. To help you take proper care of your precious device’s screen, we’ve put together this comprehensive guide outlining the best ways to clean a touchscreen display. 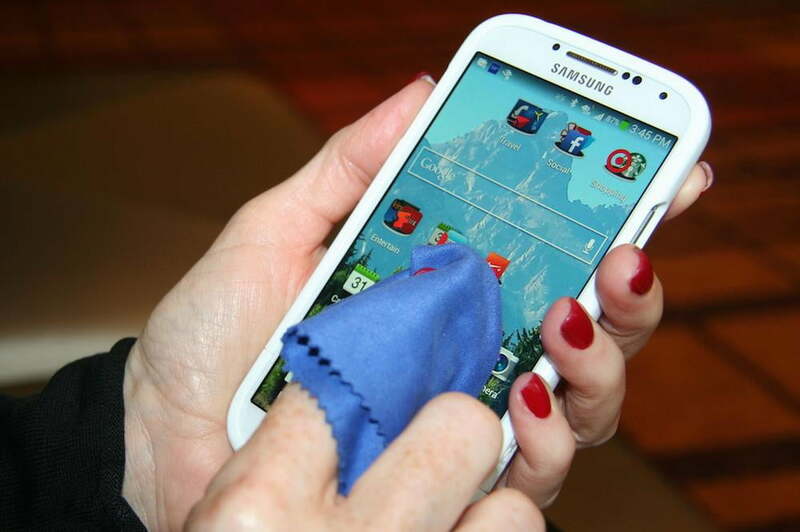 The easiest way to clean your device’s screen is with a microfiber cloth. Unlike paper-based towels, microfiber cloths gently clean the sensitive glass on your smartphone or tablet without running the risk of scratching it. Microfiber attracts and removes unwanted oils and dust, where other products can simply spread them around. We recommend stocking up on plenty of these, as they work wonders for cleaning and buffing literally any surface — lenses, computer screens, TVs, etc. Some things, like eyeglasses, come with a microfiber cloth, so you likely have one in your possession. To clean your display, turn off the screen as this allows you to see the dirt and grime better. It’s also mandatory if using water (see below). Move the cloth in a horizontal or vertical direction repeatedly. Once you finish an area of the screen, move on to the next dirty area, and continue to wipe until the surface is completely clean. For dirtier jobs, or those that require more than a microfiber cloth and a little elbow grease, consider using a minimal amount of water. First, turn off your smartphone and remove the battery (if possible). Next, wet one corner of the cloth with water — do not use soap of any kind while doing this — and clean the surface of the screen in a similar fashion to the method outlined above. Once done, use a dry part of the cloth to remove some of the water (you can also let the screen air dry). Additionally, we recommend keeping the microfiber cloth clean so that you avoid rubbing the dust and grime you’ve already picked up back on the display. To clean the cloth, simply soak it in a mixture of warm water and soap, rinse the cloth completely, then air dry it fully before using again. When a microfiber cloth is out of the question — and you need to clean your screen quickly — a strip of Scotch Tape (or another type of adhesive tape) can work wonders. Just stick the tape to the surface of the screen and peel it off to remove any unwanted dirt and grime. Then, repeat the previous step as often as necessary to clean the entire screen. If microfiber cloths and tape alone aren’t cutting it, then you can look at some more heavy-duty option. All-in-one cleaning kits come with everything you need to keep your phone reasonably clean, and even give you some tools that can help you keep it clean on the go too. This kit from Tech Armor does just that, including our old friend the microfiber cloth, two cleaning solution sprays in different sizes (one for home, one for away), and a set of 20 double-strength cleaning wipes too. Tech Armor claim the cleaning solution is completely free of alcohol and ammonia, so it shouldn’t damage your screen during use, and the soft microfiber cloths are as good as ever at picking up any bits of dirt left over from the cleaning cloths, or wiping up the cleaning solution. Over the years, we have seen some liquid solutions that are designed to clean and protect screens. Shark Proof is one such example, one that you can apply to your screen in a few easy steps. You can think of it as liquid glass for your smartphone or tablet. The good thing about this nano-coating solution is that, once applied, it hardens and can repel both liquids and fingerprints. Shark Proof is scratch-resistant and anti-microbial, too, and the company guarantees this coating will protect your device from scratches and germs for up to two years. It’s also safe to use on fingerprint scanners, as well as the iris scanner on the Galaxy S8. Obviously, if you’re looking to sanitize your phone, water will only get you so far. Since alcohol-based cleaners may damage your phone, they’re out of the question, but UV lamps can get the job done when necessary. PhoneSoap’s UV charger, for instance, can clean your phone in a jiffy using UV light. The PhoneSoap Charger has two UV-C lamps that produce a specific wavelength of light, which penetrates the cell walls of bacteria and viruses, allowing you to destroy them. Since it’s a charger, you can clean your phone while you wait. It’s unclear how well the charger works, but it remains a decent option for true germaphobes. Of course, there’s always the brute force preventative option. By keeping your phone’s body or screen from touching dirt, grime, or fingers, you can stop it from being marred. It’s not really cleaning, but if you’re tired of constantly cleaning your phone or tablet, then maybe consider something that keeps it from needing cleaning in the first place? Cases have all sorts of additional benefits as well; lots of them have an additional rim around the edges of the camera lenses and display, keeping those areas from dirty surfaces. They also have the advantage of often offering additional grip for your fingers, thanks to the soft or grippy material many case-makers use. And of course, they help protect against bumps, drops, and scratches. If you’re not sure where to start, we’ve written case guides for a ton of phones, but the best place to start is probably our guide on picking a smartphone case. Not every cleaning method is created equal, and unfortunately, there are some methods that you should definitely avoid. No matter how appealing or appropriate it might seem to use a product like Windex or some other form of cleaning solvent, never resort to using these to clean the screen on your smartphone or tablet. Cleaners such as these have a tendency to damage the protective coating found on most devices, and have the potential to ruin your phone. However, a simple Google search yields thousands of speciality solvents or cleaners which are capable of properly cleaning your device’s screen. Still, more often than not, these are just glorified versions of alcohol and water. There’s no sense in spending $60 or $70 dollars on a “smartphone screen cleaner,” when using a little water and a microfiber cloth works just as well (if not better). Of course, if you’re worried about germs and want to sanitize your device, some suggest mixing a touch of alcohol with water to clean your screen. The diluted mixture may still harm your phone, however. 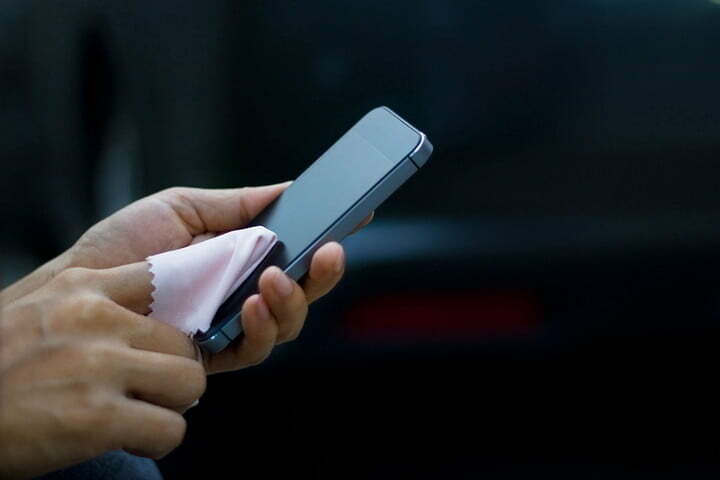 Never wipe or clean your smartphone screen with paper towels, facial tissues, or coarse cloths, as these have a high risk of scratching the surface. These scratches can build up over time and may render your touchscreen non-responsive or useless down the line. Again, a microfiber cloth is the only type of wipe you need to clean a smartphone’s screen the correct way.